U.S. Department of Treasury, “Treasury Sanctions Major Islamic State of Iraq and the Levant Leaders, Financial Figures, Facilitators, and Supporters,” September 29, 2015, http://www.treasury.gov/press-center/press-releases/Pages/jl0188.aspx. He has also promoted what ISIS heralds to be its social welfare via his online posts and videos. Western media has suggested that Hussain, often dubbed the “loneliest jihadi,” has made these appeals in order to find a bride.Jay Akbar, “Brit dubbed the ‘loneliest jihadi’ lures women to join ISIS in Syria,” Daily Mail (London), June 19, 2015, http://www.dailymail.co.uk/news/article-3131174/Brit-dubbed-loneliest-jihadi-lures-women-join-ISIS-Syria-promise-free-food-healthcare-bus-tickets-150-cash-handouts-gruesome-reality-different.html. In early 2016, ISIS leadership gave Hussain a warning after he urged potential jihadist recruits to travel to Libya instead of to Iraq and Syria. ISIS leadership reportedly warned of “serious repercussions” for Hussain after he suggested on the encrypted messaging app Telegram that arriving in Syria was difficult since the Turkish military had enhanced security at the border. Hussain reportedly urged ISIS recruits to “Come to Libya, come to Nigeria, and be part of those who build the Khilafah [Islamic caliphate] with your skulls, bones and blood.”Omar Wahid, “Supermarket Jihadi incurs ISIS wrath after urging would-be fighters to go to Libya instead,” Daily Mail, January 16, 2016, http://www.dailymail.co.uk/news/article-3403120/Supermarket-Jihadi-incurs-ISIS-wrath-urging-fighters-Libya-instead.html. In March 2016, it was reported that Hussain was using Facebook to prompt ISIS sympathizers to launch terrorist attacks within the United Kingdom. “In Islam,” Hussain posted to the social media platform, “there is only Dar Al-Islam [Land of Islam] and Dar Al-Kufr [Non-belief] (also referred to as Dar Al-Harb [War]).”Dan Warburton, “British ISIS leader ‘using Facebook to recruit terrorists to target the UK’,” Mirror (London), March 12, 2016, http://www.mirror.co.uk/news/uk-news/british-isis-leader-using-facebook-7545645. 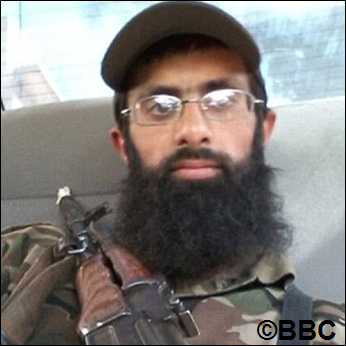 Before joining ISIS, Hussain served as a security guard in High Wycombe, Buckinghamshire. In December 2013, he entered a police station to declare his intent to travel to Syria as part of an aid convoy. Hussain later boarded a flight from Gatwick airport in London bound for Turkey, from which he crossed into Syria.Duncan Gardham and Abul Taher, “Supermarket Jihadi Omar Hussain was cleared by UK police for travel to Syria where he joined Islamic State despite being a well-known fanatic,” Daily Mail (London), May 23, 2015, http://www.dailymail.co.uk/news/article-3094490/Supermarket-Jihadi-Omar-Hussain-cleared-UK-police-travel-Syria-joined-Islamic-State-despite-known-fanatic.html. In September 2015, British media began reporting on Hussain’s Tumblr blog, which he created in April 2015 in order to disseminate ISIS propaganda.Abu Sa’eed Al-Britani, Tumblr account, accessed September 17, 2015, http://abusaeedawlaki.tumblr.com/ask. Hussain has used Tumblr to promote hijrah (migration) to the so-called Islamic State.Abu Sa’eed Al-Britani, Tumblr post, September 17, 2015. Hussain has used his Tumblr to recruit fellow Muslims to ISIS, and to field questions of those contemplating making the journey to Syria. Under his alias Abu Sa’eed Britani, Hussain has requested supplies and military hardware for the “mujahideen” (holy warriors).Abu Sa’eed Al-Britani, Tumblr post, September 17, 2015. Hussain has also used Tumblr to announce his desire for martyrdom at the hands of the enemies of God.Abu Sa’eed Al-Britani, Tumblr post, September 17, 2015. Abu Saeed al BritaniTom Whitehead, “Isil jihadist Omar Hussain complains of rude Arabs who steal his shoes and can't queue,” Telegraph (London), September 15, 2015, http://www.telegraph.co.uk/news/uknews/terrorism-in-the-uk/11866536/Isil-jihadist-Omar-Hussain-complains-of-rude-Arabs-who-steal-his-shoes-and-cant-queue.html. anwarAbu Sa’eed Al-Britani, Tumblr account, accessed September 17, 2015, http://abusaeedawlaki.tumblr.com/ask. Supermarket jihadiDuncan Gardham and Abul Taher, “Supermarket Jihadi Omar Hussain was cleared by UK police for travel to Syria where he joined Islamic State despite being a well-known fanatic,” Daily Mail (London), May 23, 2015, http://www.dailymail.co.uk/news/article-3094490/Supermarket-Jihadi-Omar-Hussain-cleared-UK-police-travel-Syria-joined-Islamic-State-despite-known-fanatic.html. The U.S. Department of Treasury designated Omar Hussain as a Specially Designated Global Terrorist under Executive Order 13224.U.S. Department of Treasury, “Treasury Sanctions Major Islamic State of Iraq and the Levant Leaders, Financial Figures, Facilitators, and Supporters,” September 29, 2015, http://www.treasury.gov/press-center/press-releases/Pages/jl0188.aspx. The U.N. Security Council added Omar Hussain to its Al-Qaida Sanctions List on September 28, 2015.“Security Council Al-Qaida Sanctions Committee Adds Names of Four Individuals to Its Sanctions List,” United Nations Security Council, September 28, 2015, http://www.un.org/press/en/2015/sc12059.doc.htm. Omar Hussain is a U.S.- and U.N.-designated British-born jihadist who reportedly traveled to Syria under the guise of a humanitarian mission to take up arms with ISIS.U.S. Loneliest jihadiJay Akbar, “Brit dubbed the ‘loneliest jihadi’ lures women to join ISIS in Syria,” Daily Mail (London), June 19, 2015, http://www.dailymail.co.uk/news/article-3131174/Brit-dubbed-loneliest-jihadi-lures-women-join-ISIS-Syria-promise-free-food-healthcare-bus-tickets-150-cash-handouts-gruesome-reality-different.html. “In Islam, there is only Dar Al-Islam [Land of Islam] and Dar Al-Kufr [Non-belief] (also referred to as Dar Al-Harb [War]).” (Facebook post)Dan Warburton, “British ISIS leader ‘using Facebook to recruit terrorists to target the UK’,” Mirror (London), March 12, 2016, http://www.mirror.co.uk/news/uk-news/british-isis-leader-using-facebook-7545645. “The UK (and the west generally) is in fact at WAR with Islam and the Muslims, as is attested to by the thousands of bombs that have been dropped in Muslim lands and the thousands of brothers they have locked up for no reason other than their love for the return of the Shari’ah. “Anyone who believes the West is at peace with Muslims has not understood the concept of brotherhood or he lacks knowledge of the reality (whether intentionally or arrogantly).” (Facebook post)Dan Warburton, “British ISIS leader ‘using Facebook to recruit terrorists to target the UK’,” Mirror (London), March 12, 2016, http://www.mirror.co.uk/news/uk-news/british-isis-leader-using-facebook-7545645. “Come to Libya, come to Nigeria, and be part of those who build the Khilafah [Islamic caliphate] with your skulls, bones and blood.” (Telegram)Omar Wahid, “Supermarket Jihadi incurs ISIS wrath after urging would-be fighters to go to Libya instead,” Daily Mail, January 16, 2016, http://www.dailymail.co.uk/news/article-3403120/Supermarket-Jihadi-incurs-ISIS-wrath-urging-fighters-Libya-instead.html. “Hijrah is not the goal, performing Hijrah should not be seen as a deed ‘done and dusted’. Hijrah is a step to a new life; to a new Islamic life. Many brothers end up abandoning many good deeds which they were doing back in Daar Al-Kufr. Some may stop reciting Quran on a daily basis, some may stop their night prayers, some may stop praying their Sunnahs, some may stop giving da’wah, and some may even stop attending the masjid for their 5 daily prayers.” (Excerpt from Tumblr entry)Abu Sa’eed Al-Britani, Tumblr account, accessed September 17, 2015, http://abusaeedawlaki.tumblr.com/ask.